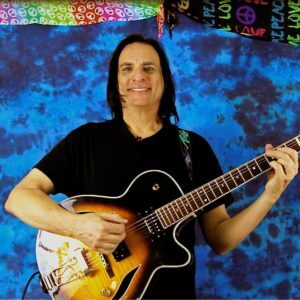 Vince Lauria is an award-winning composer, guitarist, music instructor, and author. Vince Lauria has collaborated with notable artists such as Tommy DeVito (Jersey Boys), Denny Laine (The Moody Blues, Wings), Hall of Fame recording artist Dave Marks (The Beach Boys), Duncan Faure (Rabbitt, Trevor Rabin, Madonna), film composer and Academy Award nominee John Debney (Sin City, The Passion of the Christ), award-winning film composer Jeffrey Gold (Abby Singer, Pigweed Philosopher, Nowhere Fast), TV/film composer Dan Ferguson (Toto, Steely Dan, Cher), Emmy award winner Jimmy Danelli (Winnie the Pooh, Disney), actor Mark McClure (Apollo 13, Superman, Back to the Future), Academy Award winner Timothy Hutton (The Falcon and The Snowman, Ordinary People), Jazz great Richie Cole, platinum artist Donnie Vie (Enuff Z’nuff), Jake E. Lee (Badlands, Ozzy Osbourne, Sarah Thiele), Vinnie Castaldo (Phil Collins, Aynsley Dunbar), and Mike Bordeman (drummer for Spencer Davis). Vince was guitar and music theory instructor for members of the R&R Top 40 (No. 27) charting pop-rock band Kropp Circle / Palaye Royale, the Peoples Voice 2010 Winners in the Teen category of the International Songwriting Competition (ISC) judged by music industry luminaries including Peter Gabriel, Tom Waits, Jeff Beck, Kings of Leon, Kelly Clarkson, and Ben Folds. Vince Lauria was also an instructor to guitarist Chris Iorio of the Billboard (No. 4) charting band (EMI/Virgin Records), Adelitas Way (“Invincible”). Vince Lauria is a member of Broadcast Music, Inc. (BMI). In film and television he has composed and performed the Clio Award-winning melody for the “Made In The Shade” jeans commercial working with Len Kovner at Davlen Sound Studios (1978-1982). He recently scored music for director and producer Don Barnhart (Saved by the Bell, Benson) on a TV pilot starring Daniel Baldwin and Terasa Livingstone. Vince Lauria is Winner of the Gold Medal for Best Impact of Music in a Documentary (Audience Favorite) at the 2008 Park City Film Music Festival (PCFMF) for the feature-length documentary, Man of a Thousand Faces, executive produced by actor James Hong (Chinatown, Blade Runner). Vince Lauria also won the Director’s Choice Gold Medal for Excellence at the 2009 Park City Film Music Festival (PCFMF) for his original score of the awards-winning feature documentary, Pigweed Philosopher: The Untethered Zen of Kimball Johnson, directed by documentary filmmaker Gabriel Lakey. He is currently working on the independent feature musical, Nowhere Fast: The Forgotten Story of Approach Control, directed by Ryan Williams (Abby Singer). Vince Lauria film credits are listed on the International Movie Database (IMDb). Vince Lauria’s instructional books used as a text at the Berklee College of Music, Boston. Staff Instructor at the Grove School of Music, Los Angeles, California. Created and taught music curriculum, held workshops in live performance, taught music theory, harmony and application.